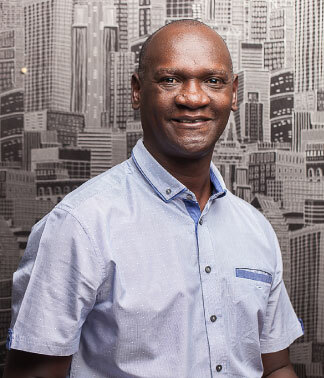 Douglas holds a Bachelor of Architecture Degree from the University of Nairobi and a Master of Science in Project Management – Construction and Infrastructure from the University of Liverpool. He has over 20 years of design and management experience. He is a member of Architectural Association of Kenya Architects and Construction Project Management Chapters respectively; a registered architect with the Board of Registration of Architects and Quantity Surveyors; and a member of the Project Management Institute. After graduating, Douglas joined Symbion International where he gathered experience in hospitality projects and thereafter moved to Dagliesh Martiall Johnson where he acquired experience on institution projects. At AIA, he is involved in design and project management and has an impressive track record in Medical Facilities, Hospitality, Educational Institutions, Residential Housing, Recreational and Social Amenities, Corporate Offices, and Factories. Douglas lives to add value and improve the lives of the people around him. This is his approach to life in both professional and personal spheres. This belief has led him to rewrite the project management manual, away from the process driven approach to project delivery, into a more human relational process. Away from the office, Douglas is an amateur photographer and loves sports. He is one of the founding members of Wazalendo Hockey Club that plays in the National Premier League and Chair of the trustee. This platform provides Douglas with a forum for engaging with young people from the Academy with a view of mentoring them to strive for excellence.